Alpine and Bog Plants, 1908. Don’t think small — The biggest mistake homeowners make when it comes to building their first pond, stream, or waterfall is that the finished water feature is too small. It’s a natural tendency to be timid when creating any permanent, quasi-public, artistic statement, let alone one that requires you to calculate water volume while deciphering new terms like “gph” and “lift.” Relax—but be bold at the same time. Your pond will not look as large as your initial excavation once the stone edging and plants are in place. A polite little stream ending in a small waterfall won’t result in one of your main objectives: the rumbling sound of splashing water. Brooks should babble. I’ve stood next to silent streams and sat beside waterfalls that became inaudible when the wind picked up. Go bigger than you initially think. Do use rubber liners — Upon initial review, it does seem easiest to purchase one of those preformed, plastic ponds available commercially, particularly if all you want is a small water garden. But there you go again—I said don’t think small. The odds that a preformed plastic pond is the perfect shape for the area in your yard in which you envision a water garden, or that it’s big enough in the first place, are one in a million. Always spread a one-inch layer of sand on all flat and moderately sloped portions of your excavation, then install protective pond fabric/underlayment, over which you install a high quality, rubber pond liner. Excavate the hole to include various ledges (like steps) around the edge to hold plants, but gradually taper some of the shoreline so that it resembles a beach gently sloping into the water. You won’t get a natural look buying some glorified kid’s wading pool. 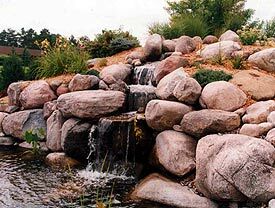 The display water gardens at Hedberg Landscape Supply in Plymouth, Minnesota use ample stone plus tree and shrub plantings to compensate for the flat surrounding terrain. Don’t build a “pimple waterfall” — If your lot is flat, don’t build a giant stone pimple in the middle of it, one that somehow miraculously contains a waterfall. It will be a miracle if it looks even remotely natural. 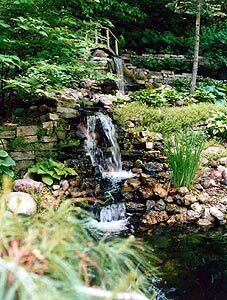 For flat lots you’re best off choosing a corner as the starting point for your upper stream/waterfall, then hauling in dirt to raise the area (constructing retaining walls on the back two sides, if need be) so that the waterfall appears natural. 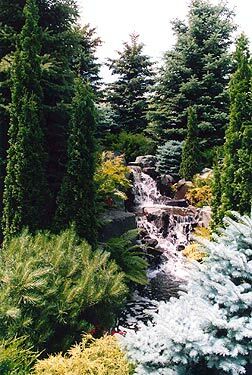 Use of large stone, and tree and shrub plantings, behind and around the waterfall help create a natural effect also, but only if there is some semblance of a hill in the first place. Do excavate at least one foot below grade for streams — Think about streams in nature; the water doesn’t skim along the surface of the incline like a sled going down a hill. Streams have eroded the soil so that they slice down through the incline. Excavate at least 12” for even the smallest (watch it) streams, so that by the time you lay the liner and cover it with some large rocks, smaller stones and gravel, you still have a true depth of 6-8”—even deeper than that for big, boisterous streams. Dig deep, then plant shrubs and perennials so they loom over the water surface. Do buy a good book on the subject, and ask for help at the water garden supply nursery — The engineering of ponds, streams and waterfalls is fairly straightforward, and newest pond liners, adhesives, pumps, hoses, and filtration systems, when installed properly, all but guarantee you’ll be creating a healthy water system that will support plant life (and fish, if you so choose). You’ll be purchasing these items at nurseries and/or landscape supply yards, so ask the experts there what book(s) they recommend. They’ll probably have a good one for sale. The Internet will have loads of information and resources too, of course. Look at pictures that each landscape firm will provide that showcase their work. This will help you narrow your choice down to perhaps two or three finalists. Then, even more important, go see some actual water gardens they’ve created. 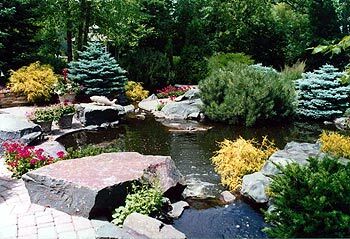 Landscapers should have some clients willing to let you view their water gardens. Photos can be shot so that the water garden looks fabulous, but how well has the pond, stream, waterfall, etc., held up after four years? Was the engineering sound? Remember that a water garden involves plantings in addition to the mechanics of water. Some landscapers are aces at building a pond or stream that looks like a slice of the Boundary Waters, but don’t know beans about how to plant the area around the feature. Others can use sensational planting schemes to cover up what is a fairly mediocre pond. Naturally, you want a landscaper that does both well. Study the photos and water gardens you visit with this dual expertise in mind. Are the plantings a good compliment to the water feature, or, come to think of it, are they a hodge-podge, perhaps a little sparse? Are the plants placed with an eye at creating subtle (or bold) contrast with the stone? Are their evergreens for winter interest? Nymphaea spp. (Water Lily) – Most agree that the bloom of the water lily is the most beautiful of all aquatic plants. A pond without water lilies is in no way reasonable, for they are easy to grow and overwinter. There are over 70 species of water lilies, grouped into two general categories based on their frost tolerance—tropical and hardy. The most common and best for Twin Cities pond gardeners are hardy lilies, which are further divided into standard and dwarf varieties. Grow lilies in pots placed at the bottom of the pond or raised on bricks. 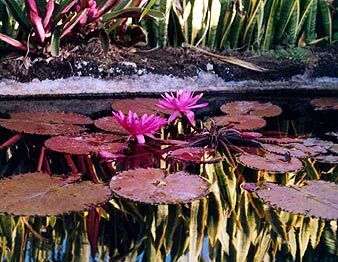 Depending on variety, standard water lilies are submersed between 12-24” inches, while varieties in the dwarf group are best planted 6-8” deep. Dwarf water lilies look terrific in small containers such as whiskey barrels or other tub-like gardens. Full sun. 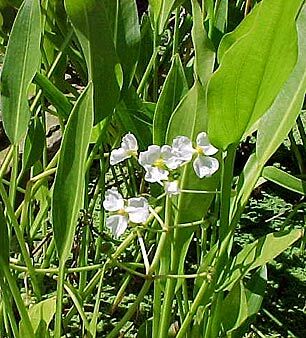 Sagittaria latifolia (Arrowhead) – In larger ponds, grow Arrowhead next to shore to add commanding vertical accent. Tall stalks rise to 4’ in midsummer from mounds of large, triangular basal leaves, then spray out white, 3/4” flowers in whorls of three. Plants often bloom into September. Full sun. Cyperus alternifolius (Umbrella Palm) – This is another plant grown for its foliage. Umbrella palm looks great rising out of the water next to shore. Arching, triangular, green stalks grow to 36” tall topped by long, narrow leaves that spread out then curve down like the struts of an umbrella. The total show can reach 5’ in height. There is also a dwarf variety that pulls the same stunt at around 30” in height. Sporadic flowering is insignificant, but this is important to note: This plant is invasive and must not be grown in true ponds or streams, and must not be grown in water gardens where either plants or wind-blown seed could reach waterways. Sun to shade. Iris pseudacorus (Iris) – Minnesotans who explore our state’s bountiful wilderness areas have probably come across this native stunner in yellow bloom in the wild (or in the shallow bays of some of our city and suburban lakes). I. versicolor (Blue Flag) is another native available at nurseries. 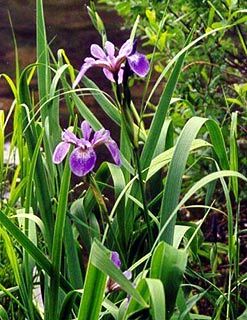 Suitable for container water gardens, ponds and bogs, irises bloom heavily in spring, with cultivated varieties running the color gamut through white-yellow-red-blue, with many featuring bicolor blooms. 24-36” sword-like foliage looks good all season. Sun to part shade. A great many metro nurseries that sell traditional garden perennials and annuals have jumped into water gardening, and sell a good selection of the plants listed above. Still, the small number of local growers who specialize in water plants are impossible to beat for quality of plants, and the expertise they’ll add during your shopping experience. Minnesota’s local queen of water lilies is Soni Forsman, whose home-based business Water Lilies by Forsman (Eagan/Appointments: 651-454-3895) specializes in the best standard and dwarf water lilies for Minnesota gardens. The short drive south of 494 to Soni’s nursery to select and purchase plants is worth it because you get to chat with Soni, who will gladly answer every question concerning water gardening that can be asked. Vermillion Waters (Rosemount/651-480-1986) sells all water plants noted above in addition to many, many more. They open for drop-in business beginning May 15. CG: Should a water garden, particularly a pond, be in the sun or shade? RG: That depends on the purpose of the pond. If you have your heart set on growing water lilies, you’ll need to place the pond so that some or all of it receives at least five hours of direct, midday sun. 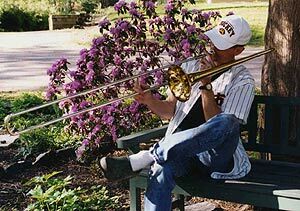 Other plants prefer partial shade. If you want to have fish in your pond, you’ll also need some shade, either from trees, plants that grow out over the water surface, or large, flat rocks placed as ledges for the fish to hide under when the sun is overhead. CG: Isn’t it true, though, that trees near water gardens pose a maintenance problem due to the leaves that collect in streams and ponds? RG: That was the great theory until people discovered that if there is a tree anywhere in the county, its leaves will eventually find your water garden. So you buy a skim net and clean out the leaves. I’ve seen wonderful streams and ponds set into the woods that are absolutely mystical. Every couple of days, grab your net and skim the leaves out. It takes you a few minutes. Big deal. Turn off your cell phone for ten seconds. CG: Earlier you recommended that portions of a pond’s shoreline should gradually taper into the water, like a beach. Isn’t that an invitation to raccoons to dine on your fish? RG: I’ve found that if your pond has fish, your pond will attract the attention of raccoons, and they’re going to get into that pond one way or another. 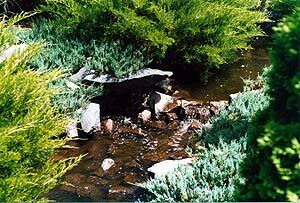 If the pond has straight sides, what they will do is claw their way out, sometimes at the considerable expense of the rubber liner, even when the liner starts out properly hidden by stones. Better to give a raccoon easy access, then create enough depth and underwater stone overhangs that the fish can safely hide. After a few unsuccessful fishing expeditions, a raccoon will go back to merely knocking over your garbage cans.